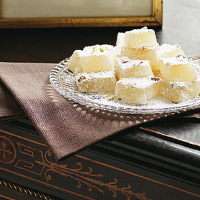 This decadent treat is best enjoyed with a cup of thick, sweet Turkish coffee. Measure the caster sugar into a stainless steel pan with 300ml water and the lemon juice. Mix 75g cornflour with a further 200ml cold water until smooth and stir into the sugar mixture. Sprinkle the gelatine over and slowly bring to the boil, over a medium heat, simmering briskly for 20 minutes. Add the rosewater. Meanwhile, line a deep 21cm x 27cm tin with clingfilm. Sift the remaining cornflour and the icing sugar together and use 2 tbsp to dust the base and sides of the tin. Remove the saucepan from the heat and set aside for 10 minutes to cool. Stir in the rose water and pour into the prepared tin. Sprinkle with the nuts and leave to set in a cool place (not the fridge) for at least 12 hours. Cut into cubes with kitchen scissors and, on a plate, lightly dust with the remaining cornflour and icing sugar mixture, rolling each cube gently to coat. Eat immediately or store in an airtight container for up to 1 month. This recipe was first published in November 2008.